South Gippsland basin has been divided into east and west sections for clearer map display. The eastern section of Basin 27 has extensive forest, the wilderness area of Wilsons Promontory and numerous coastal inlets and estuaries. The terrain consists of forested mountains and hills in the northwest, and flat plains in the east with a flat coastal strip composed of dune complexes. Farmland is used for grazing and some cropping. All the rivers rise in cleared or forested hills and have coarse substrates in their headwaters. The high annual rainfall (1,000-1,400 mm) in this area results in a reliable flow regime all year, despite the impact of the lower rainfall area (600-700 mm annually) along the coast. The area is underlain by sedimentary and volcanic rock with unconsolidated deposits in the central plain and along the coastal dunes. 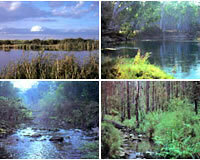 Most major waterways are of a similar length (15 -25 km) with the longest being Merrimans Creek (60 km). The most widespread and abundant freshwater fish are eels and galaxias species. There are no angling waters of particularly high recreational value. Access can be difficult and the lower reaches of most waterways have turbid water and mud/sand substrates. Angling species are mostly both species of eel, some congoli, a few river blackfish and some scattered populations of brown trout, Australian bass and estuary perch. The Agnes, Albert, Bruthen, Franklin, Tarra and Tidal Rivers and Merrimans Creek, have small estuaries which provide angling for a range of estuarine fish species. Some waters in this Basin are commercially fished for short-finned and long-finned eel. (Large fish): Australian bass, Australian grayling, estuary perch, long-finned eel, river blackfish and short-finned eel. (Small fish): Australian smelt, bridled goby, climbing galaxias, common galaxias, congoli, Cox's gudgeon, eastern dwarf galaxias, flathead gudgeon, mountain galaxias, pouch lamprey, shorthead lamprey, southern pygmy perch, trout galaxias and striped gudgeon. The small spiny crayfish, Euastacus neodiversus, is present on Wilsons Promontory. Short-finned eel is the most widespread species. Three species of galaxiid are abundant with several creeks containing all three. Small numbers of Australian grayling have been found in four rivers. The most interesting feature is the large number of native fish species in most rivers and the scarcity of introduced fish. Brown trout are common in only a few waters and restricted to the headwaters in areas of fast-flowing water and coarse substrate. The trout are usually small in size. Small numbers of Australian bass have been found in five waters. Estuary perch are more abundant and widespread with good populations in the lower reaches of several rivers. The most common and widespread angling species in the estuaries are yellow eye mullet, flounder, luderick, black bream, Australian salmon, estuary perch and some sea mullet. Other species can occur at times. Stocking Program (stocking plans for desirable species are based on an approved Victorian Fisheries Authority stocking policy and are reviewed annually via Vic Fish Stock). In this Basin, all the rivers carry self-sustaining populations of fish and stocking is not considered necessary. Family Fishing Lakes Program (an ongoing project of stocking small waters within urban areas with larger trout, for junior and disabled anglers – see Introduction for further information). None are established in this Basin. Trout - Franklin, Agnes and Tarra rivers and Merriman Creek and tributaries upstream of the South Gippsland and Hyland Highways. Tarwin east and west Branch and tributaries north of the South Gippsland Highway. Hyland Reservoir. Mixed - Bass, Tarwin and Powlett rivers south of South Gippsland Highway. Native - East South Gippsland south of South Gippsland Highway including Wilsons Promontory. Jack and Albert rivers and tributaries. Victorian River Health Program (an on-going State Government initiative to achieve healthy rivers, streams and floodplains). Major activities were on the Tarra River and included removal of willow and pest plants and the protection of banks by fencing, re-establishing native vegetation and engineering works when necessary. - manages farm and irrigation water diversion and development of Stream Flow Management Plans. - manages urban water diversion. The Tarra River has been listed as a Representative River of the geomorphic unit of South Gippsland Ranges and Riverine Plains. Mount Vereker Creek, in the centre of Wilsons Promontory National Park. (wetlands of international significance - Convention on Wetlands, Ramsar, Iran 1971). Corner Inlet, which is the receiving body for most of the water flowing out of this Basin. The Australian grayling, Cox's gudgeon and the eastern dwarf galaxias are listed as threatened species in Victoria. (Department of Sustainability and Environment [DSE] Dec. 2007). A list of Victorian threatened species together with scientific names of species, a definition of the terms used and their national status is available on the DSE web site. Species in bold type are also listed under the Flora & Fauna Guarantee Act 1988. These species cannot be taken or kept within Victoria without an appropriate written order, licence or permit.